Cape Town – With no help, no hope and no resources, a public prosecutor has to try and prove her innocence in the intriguing new local SABC1 prison drama series Diamond City starring Noxee Maqashalala and starting tonight at 20:00 on SABC1 (DStv 191). Produced by Quizzical Pictures and directed by Rea Rangaka, Zandile (Maqashalala) is South Africa's most prolific public prosecutor – until she gets deceived and framed by the very person she trusted most. After getting closer to unravelling a big conspiracy, Zandile is framed and finds herself in jail where she must now try to survive while gathering evidence from inside the very same jail she has sent other women to. 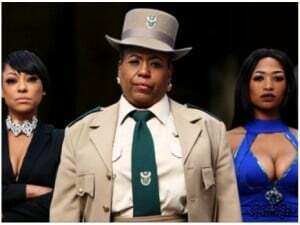 The 13-episode Diamond City – the title a play on the Johannesburg Correctional Centre jail, ironically also known as "Sun City" – will depict the brutal world in which the main character of Zandile now finds herself in as she tries to prove her innocence. Besides starring in the lead role, Maqashalala is also an executive producer of Diamond City, along with Harriet Gavshon and JP Potgieter, with the series written by Nonzi Bogatsu. Zandile's reality is worse than she could have ever imagined: Not only are the conditions appalling, the guards abusive and the hopelessness crushing but she is also about to face a number of women whom she last saw when she was the one who got them sent to jail. Other cast members includes Thabang Molaba (Mak), Lehlohonolo Makoko (Skhosana), Angela Sithole (Pearl), Ilse Klink (Abida), Makgano Mamabolo in the role of Rosina, alongside acting veterans Fiona Ramsay and Seputla Sebogodi. Diamond City 60 Seconds from Quizzical Pictures on Vimeo.